Northamptonshire rained on Leicestershire’s opening-night party for the new Grace Road floodlights as Richard Levi’s 61 set the platform for the visitors to leave with a five-wicket victory off the penultimate ball. Chasing Leicestershire’s 178, Umar Akmal top scoring with an unbeaten 52, Levi’s 20-ball half-century saw the Steelbacks to 75-1 from the powerplay and they were in control at 111-3 when rain forced a 35-minute delay. With a revised target, the Steelbacks made hard work of the chase, which went down to two required from two balls, but Sri Lankan debutant Seekuge Prasanna pulled his first ball in Northants colours for six to seal victory for the Steelbacks. Prasanna also bowled a crucial spell, taking 1-21 in his four overs as Leicestershire struggled in the middle overs after a flying powerplay of their own, before Akmal’s late surge took them to 178-5, 54 coming from the last four overs. Levi was Northants leading run-scorer in last year’s competition and after his eighth T20 half-century for the county, which included seven fours and three sixes, he was delighted to see last year’s runners up get off to a winner start, a contrast to their three opening defeats 12 months ago. “It’s nice to come here, especially when they dominated the four-day game we played, to come out here and get a win over them was good,” he said. “We started off quite slowly last year so it’s good to come out and hit the ground running. “The way we started to restrict them to 180, at one stage they were cruising to 200, we pulled it back nicely in the middle, we tried our best to make it exciting for the crowd but it’s always good to start with a win a bit of momentum. Whilst Prasanna took the headlines with his match-winning six, it was arguably his bowling that was a key turning point in the game after Leicesteshire’s two captains, Mark Pettini and Mark Cosgrove combined to take 62 from the powerplay. Cosgrove departed lbw to Azharullah for 27 in the over after but it was Prasanna’s introduction that put the brakes on the innings, getting the wicket of Kevin O’Brien caught at long-off, and conceding 15 singles as well as one Akmal six in his final over. Pettini hit seven boundaries in the powerplay but didn’t find the fence again before falling lbw to Northants’ second spinner Graeme White for 43, as the innings looked to be falling short before Akmal found his range after a shaky start. 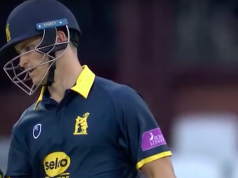 Whilst Levi was eventually the Northants hero, he was the villain earlier as with Akmal on 26, he skied one high into the Leicester night, only for Levi to put it down. The Pakistani then doubled his score in ten balls, with three fours and three sixes, sharing a stand of 51 in five overs with Luke Wells (21) to take Leicestershire to an imposing total. Northants themselves had a new look opening partnership following the departure of David Willey, with Adam Rossington stepping up to join Levi, and the pair got the reply off to a flyer, taking 16 and 20 of the third and fourth overs respectively to get Northants ahead of the chase, despite Rossington falling for a 13-ball 23. Two wickets in two overs pegged back the Steelbacks, including Levi, who slapped a Neil Dexter full toss straight to cover, but they remained in full control when rain forced the players off the field just past the halfway point. The revised target left them chasing a further 53 off 42, but a simple enough equation turned tricky as the experienced heads of Neil Dexter and Kevin O’Brien kept things tight, with Steven Crook running himself out when 22 was needed from 17. However, Ben Duckett kept a calm head, and kept finding crucial boundaries just when required, his 37 off 34 guiding the Steelbacks home, despite a slight wobble when captain Alex Wakely got bogged down in the penultimate over. Wakely fell to the first ball of Ben Raine’s final over with seven required but, after Duckett swept his fifth boundary, Prasanna stepped up and cleared the ropes from his first delivery to became an instant hero among his new teammates. Man of the Match: Richard Levi. The big South African got Northants’ run chase off to a flyer with a 20-ball half-century inside the powerplay, eventually falling for a 29-ball 61 that ensured the Steelbacks were far enough ahead to survive their late wobble to get over the line.